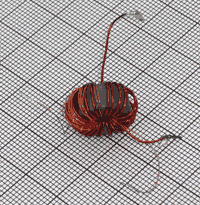 Here is a circuit you can use to measure the B-H characteristics of a ferromagnetic component. It works best with ring cores (toroids) but may be usable with other shapes having a closed magnetic path. The circuit, as shown, will plot the hysteresis loop for a half-inch diameter, high permeability ferrite ring; adaptations for other components are also given. Figure 1: Schematic of circuit for plotting the B-H characteristics of an inductor. Tolerances are only significant on R2, R6 and C1 (which is polyester or polycarbonate). C2 and C3 are ceramic. Photo. 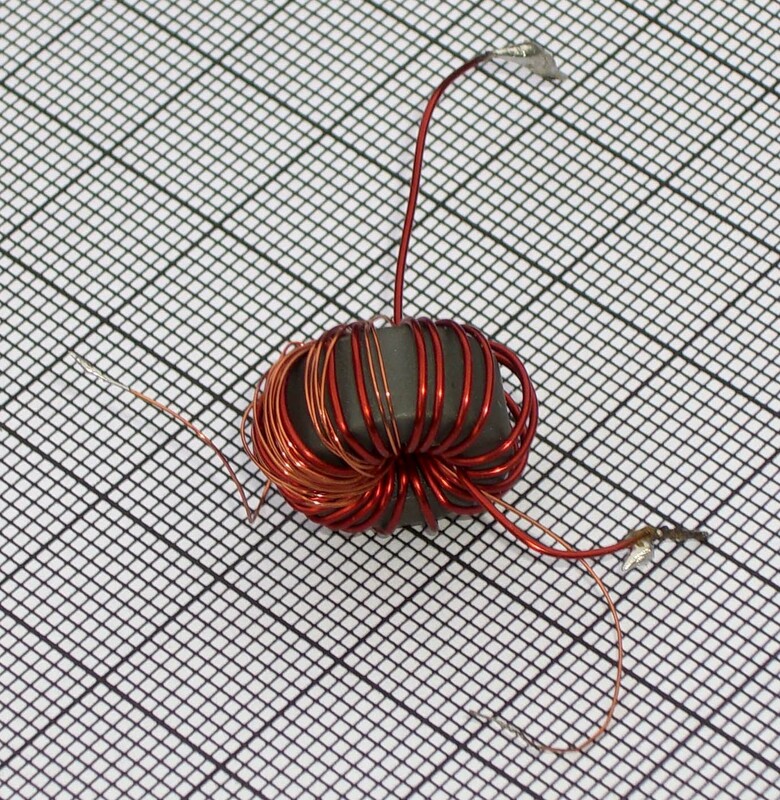 1: A toroidal ferrite core custom wound to serve as a test inductor. I chose to use two windings. Although a more complicated circuit could be devised (which only required one winding) this circuit is cheaper, easier to understand and more flexible. There is nothing special about the number of turns used - just as long as you know how many you have. The secondary can be made from wire that is as thin as you like, while the primary need only be sufficiently thick not to get hot enough to heat the core much (the saturation level falls fairly rapidly with temperature). I used 0.2mm and 0.5mm respectively. You will need a source of AC current of about 0.3 amp. If you're feeling lazy and don't want to wind as many turns on the primary then you'll need a higher current. I used a lab supply, which gave up to 25V at 50Hz, together with R1 to limit the current. You can improvise other solutions. A mains variac followed by a step-down transformer should work well. Note: if you wish to measure very small rings with low permeability (such as those used in radio receivers) then you may need a source running at a few kilohertz in order to get sufficient secondary voltage. If you do this then you should also decrease C1. The oscilloscope must be a dual channel model able to operate in an 'X-Y mode' (with the horizontal deflection controlled by a signal input rather than the timebase). Although you can use AC coupled inputs on the oscilloscope during initial tests make sure that they are set to DC coupling for the highest fidelity plot. I used an HP 54600 digital storage 'scope. A DSO is handy if you wish to plot initial magnetization curves. Component tolerances for R2, R6 and C1 will affect the accuracy of your results. The op-amp is used as a voltage integrator. A common problem with this circuit is drift due to voltage and current offsets. R7 helps keep drift under control but you will still need to adjust R5 so that, with no signal in or out of the integrator, the output on pin 1 remains steady. Figure 2: Screnshot of B-H curve for the test toroid under moderate MMF. Where Np is the number of turns on the primary. For the core I used this gives H = 22 × 0.146 / 0.0276 = 116Am-1. 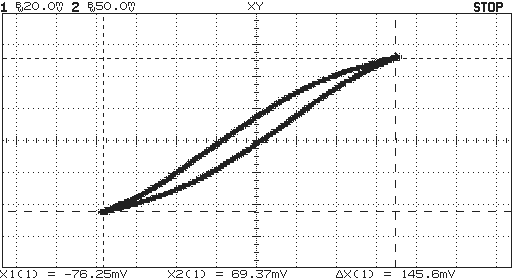 This is a good result because it establishes that the op-amp voltage is proportional to the core flux. You can understand why an integrator circuit is required because Faraday's Law demands that, at any instant, the coil voltage represents the rate of change or differential of core flux. By carrying out an integration (which is the reverse of differentiation) we 'get back' to a signal representing the actual flux in webers. Now, the above calculation isn't to be taken too seriously - there are several shaky assumptions, but as an indication then it should be worthwhile. Figure 3: Screnshot of B-H curve for the test toroid under higher MMF. Note the change of scale on the X-axis. The difference in shape is due to the onset of saturation. 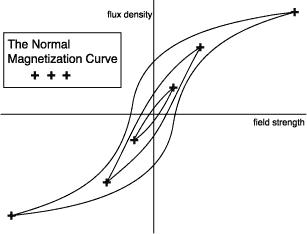 Figure 4: The normal magnetization curve as the locus of the tip for each hysteresis loop. 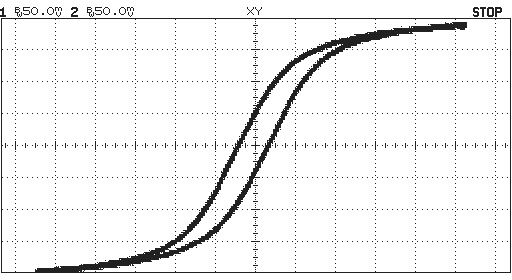 As you raise the primary current the tip of the hysteresis loop traces out a normal magnetization curve. It is similar in shape to the initial magnetization curve, and is a convenient way of describing the material behavior. 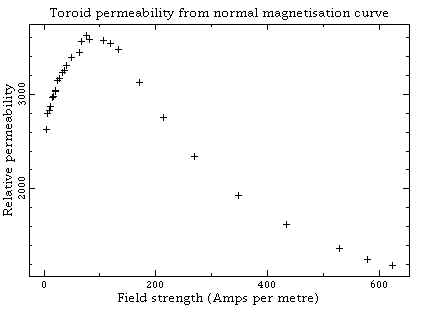 Figure 5: Relative permeability for toroidal ferrite core derived from the normal magnetization curve. Insufficient signal on the output of the integrator: try reducing C1. You could also reduce R6 but there's a risk that the secondary current will start to affect the H field. You see extraneous loops at the tips of the B-H curve: use DC coupling on the 'scope inputs.